Cup cakes are good to eat and tempting to look at. 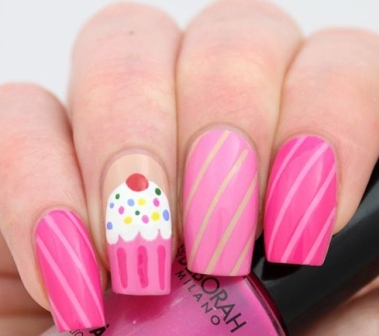 So why not try a cup cake nail art for the summers? 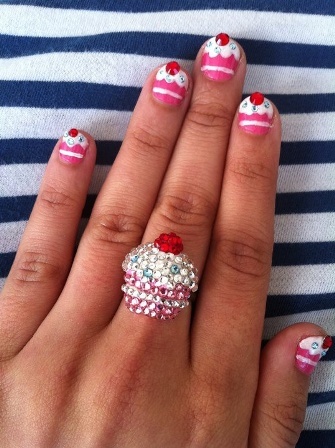 It is not that difficult to create cupcake nails. You can wear these nails to a party or for your home coming. You can wear these nails if you have a sleep over party with your girl buddies. 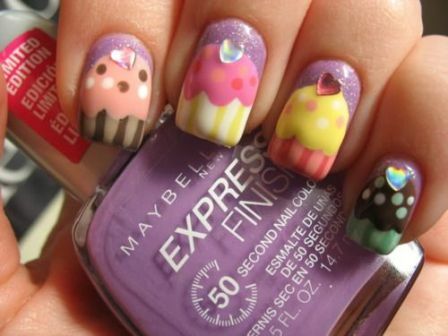 Here Is Our Selected Best 9 Cupcake Nail Art Designs. Cupcake nails are very easy to do. You can do these on short nails as well. 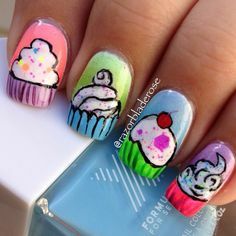 So if you have trouble growing long nails or think that you miss out on various nail art choices because you don’t have long nails, then give cup cake nails a try. You can add some small crystal beads to represent the sprinkles on the cupcakes. Grab your dotting tools to create a pattern of dots of different colours like the ones shown above. 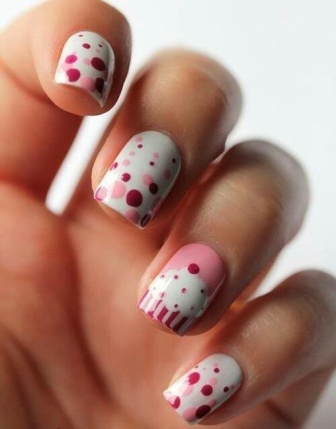 You can do a small cup cake on just one finger and fill the others with just dots. Use stripes on the body of the cup cake. Keep the top of the cup cake white with a red or pink dot on top to represent a cherry. 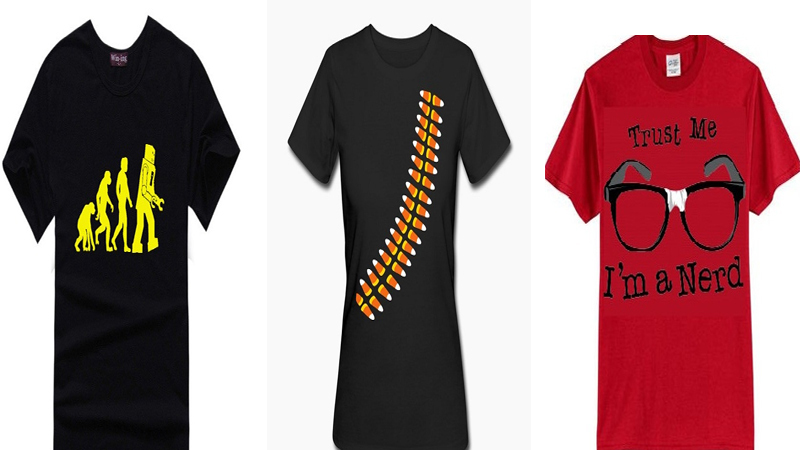 Try this design and have fun sporting it. Want to keep it simple? 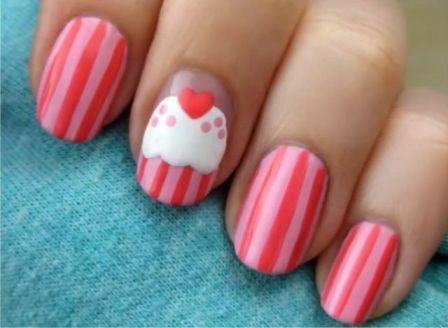 Try out simple stripes for your nails in two colours and a cup cake for just one finger. 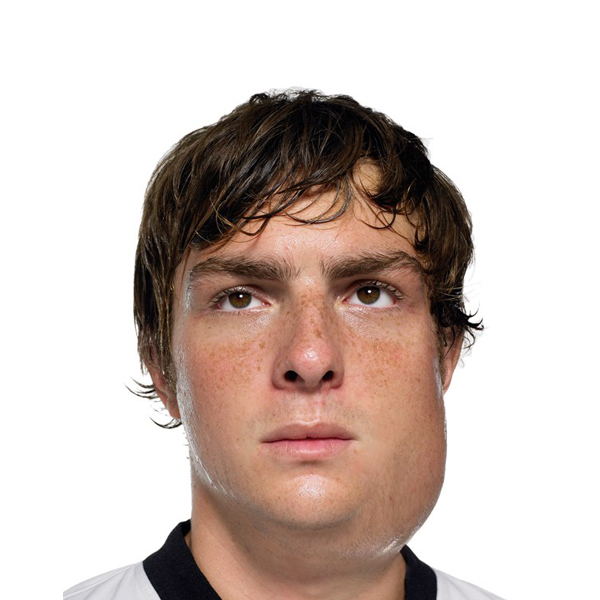 This will consume less time and will be easy to do. Use a heart shaped sticker or stud for the cherry. You can create a variation of the easy striped cup cake nail art design by making the stripes diagonal instead of vertical. For the cup cake, you can make it a bit special by adding multi coloured dots on it. You can wear a multi coloured nail art with any dress of yours. Use your dotting tools or toothpicks for this nail art. 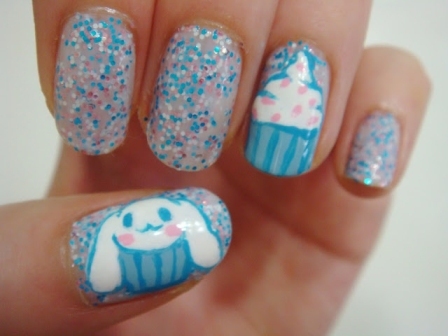 You can try a glitter glam nail art design representing cup cakes. 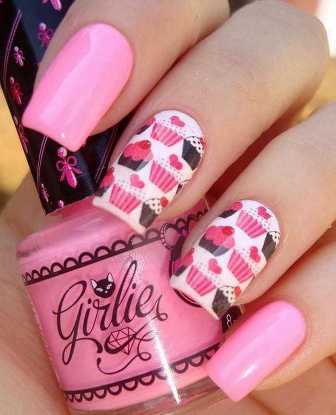 Try using sweet pink colours and sequined nail paints. Use dotting tools for polka dots design on 1 or 2 nails. Make a small cup cake and decorate the top with a rhinestone representing a cherry. 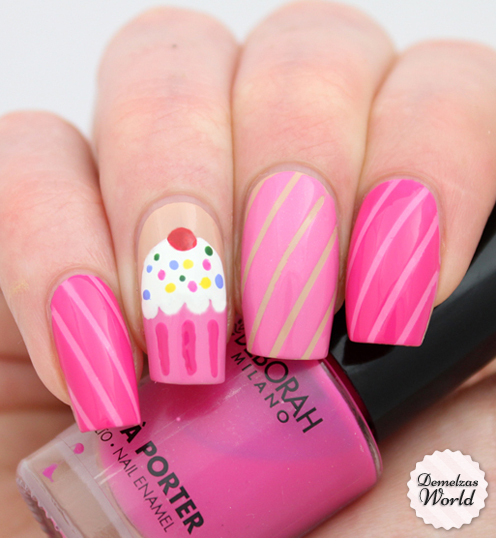 Try out a cup cakes and ice creams nail art design like the one above. 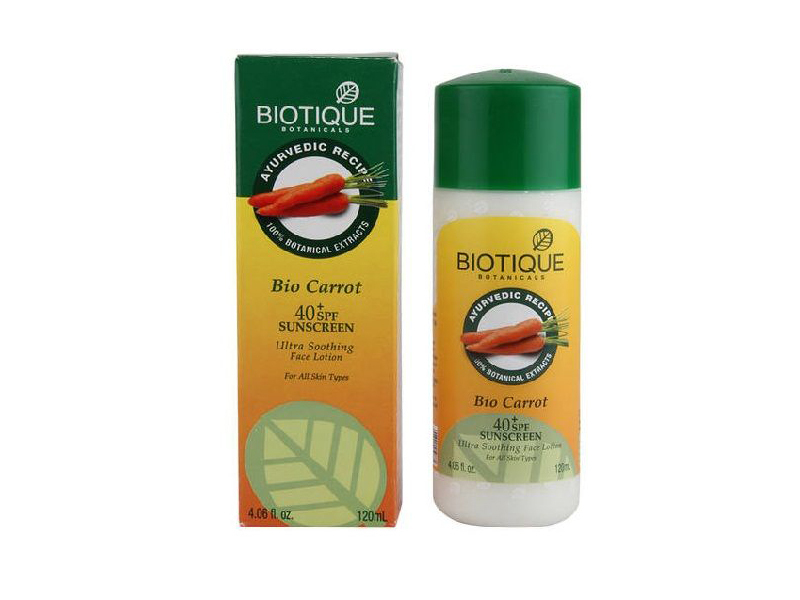 Try this for a girls night out or for that special back to school occasion. You can try water decals or go for free hand painting. A little variation to normal nail art designs is always welcome. You can try out a puppy face cup cake design for your nails like the one above. Keep other nails simple with the use of coloured sequins and a skin colour base paint. You will need to have good skills at free hand painting. You can try out some water decal cup cake designs like the one above. Use the decals preferably on white base nail paint to make the view more distinct. You don’t always need to stick to traditional white cup cake designs. You can make cupcakes in different colours. Different colours will represent different flavored cupcakes. Use crystal hearts to add a bit of glam on top of the cakes.